Purdue Pharma faces 1,600 more lawsuits. 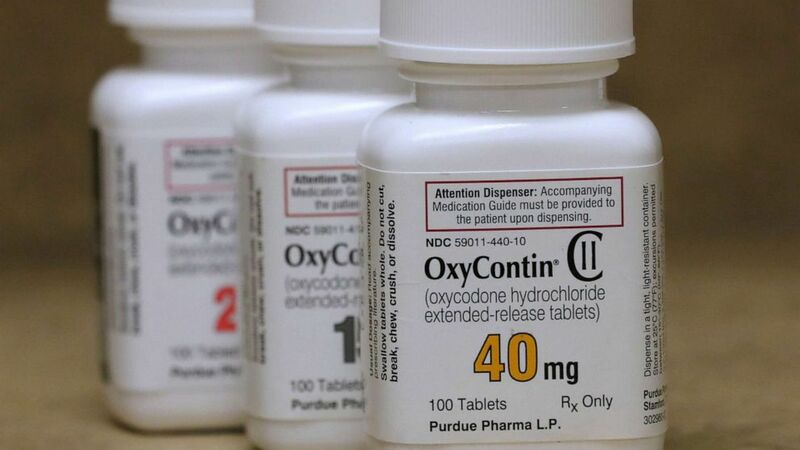 Purdue Pharma, the company that makes OxyContin, settled its first significant lawsuit on Tuesday related to its aggressive marketing of a painkiller that is part of the ongoing nationwide opioid epidemic. The $270 million settlement with the state of Oklahoma marks a milestone for the company, which is exploring filing for bankruptcy and currently faces 1,600 additional lawsuits by cities, counties and states related to its role in the painkiller crisis. The deal earmarked $200 million for the Oklahoma State University Center for Wellness and Recovery, a treatment and research center, that would boost the center to a national level. Purdue will also pay $60 million toward the state's legal fees. An additional $12.5 million will go towards measures fighting the opioid epidemic in cities and counties in Oklahoma. Oklahoma Attorney General Mike Hunter's office, which filed the lawsuit, disclosed the terms of the deal at a press conference Tuesday afternoon. In addition, Purdue will not promote opioids in Oklahoma, including "employing or contracting with sales representatives to health care providers" in Oklahoma, Hunter said. The company issued a statement supporting the settlement. “Purdue has a long history of working to address the problem of prescription opioid abuse and diversion. We see this agreement with Oklahoma as an extension of our commitment to help drive solutions to the opioid addiction crisis, and we pledge Purdue’s ongoing support to the National Center and the life-saving work it will do for generations to come," Dr. Craig Landau, CEO of Purdue Pharma, said in a statement emailed to ABC News. "The addiction crisis facing our state and nation is a clear and present danger. Last year alone, out of the more than 3,000 Oklahomans admitted to the hospital for a non-fatal overdose, 80 percent involved a prescription opioid medication," Hunter said. "Additionally, nearly 50 percent of Oklahomans who died from a drug overdose in 2018 were attributed to a pharmaceutical drug." "Deploying the money from this settlement immediately allows us to decisively treat addiction illness and save lives. This agreement is only the first step in our ultimate goal of ending this nightmarish epidemic," Hunter said. "We are out of time to deal with the responsibility. We have to deal with this crisis." Hunter said the state struck the deal in part because of Purdue's potential bankruptcy, but that the settlement is structured in a way to guarantee the state will be paid, no matter what the company's financial fate may be. (George Frey/Reuters, FILE) In this file photo bottles of prescription painkiller OxyContin pills, made by Purdue Pharma LP sit on a counter at a local pharmacy in Provo, Utah, April 25, 2017. Purdue Pharma is owned by the Sackler family, which is facing increasing censure from financial and philanthropic institutions for its role in manufacturing and marketing opioids. The families of Dr. Mortimer and Dr. Raymond Sackler, who were not defendants in the suit, announced an additional $75 million donation Oklahoma State's National Center for Addiction Studies and Treatment. "We applaud Attorney General Hunter for his thoughtful and constructive approach to this agreement, which recognizes the complexity and multiple causes of our nation’s addiction epidemic," the Sackler families' statement said. "We also want to make clear that the recent attacks on our family are not accurate and misdirect attention away from crucial issues such as the terrifying rise in illicit fentanyl overdoses." Experts said the OxyContin producer could have settled to avoid more public disclosures. The settlement was announced the day after the Oklahoma Supreme Court ruled against Purdue -- as well as Johnson & Johnson and Israel-based Teva Pharmaceutical Industries, the other defendants in the suit -- to delay an upcoming trial by 100 days. The start date remains May 28 in Cleveland County District Court. "I was surprised at the size of the settlement," Richard Ausness, an expert in product liability at the University of Kansas Law School told ABC News. "But Purdue avoided a nasty trial and the possibility that more evidence of wrongdoing would come out during discovery or at trial. In addition, most of the settlement money has been earmarked for addiction treatment and Purdue might claim that it is contributing to solving the addiction problem instead of frittering away its assets in fruitless litigation." Ausness added that Teva and Johnson & Johnson may be able to settle with the state for less because they had a much smaller share of the market. "I think that it would be wise for them to settle in order to avoid being 'home cooked' by a hostile Oklahoma jury if the case goes to trial," he said. Johnson & Johnson and Teva did not respond to a request for comment.